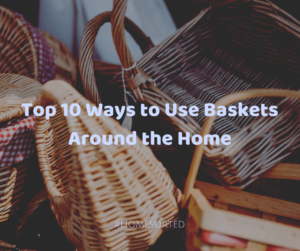 Top 10 Ways to Use Baskets Around the Home - Home Sorted! Unless you’ve been living under a rock, you’ll be aware that baskets are having quite a moment. Not only do they look fantastic around your home, but they’re even more amazing for sorting your hard to organise items. Doesn’t that sound nifty? Keep reading for our top 10 ways to use baskets around the house. Baskets are the perfect solution for any area with under storage. This includes beneath the bed, coffee tables and even hallway console tables. You can use under storage to sort any manner of items from shoes to toys and beyond. Make your pantry easy to navigate by creating snack baskets for your children. Keep pre-portioned snack foods in baskets to allow your kids a grab and go snack each afternoon. Do you have toy clutter in your family room? Dress it up by tossing everything into a basket! Problem solved. Linen cupboard organisation is made easy with baskets. Consider sorting linen and towels into separate baskets. You can even designate one to spare toilet rolls. Does your laundry system need an overhaul? Consider sorting your dirty laundry with baskets. The natural fibres are great for dirty or soiled clothes and will ensure that damp clothes are able to breathe. Jazz up your home office by using a basket for waste paper. Have you ever had a recycling basket that looks that good? Baskets are a great way to keep hobbies organised and in one place. This also allows you to move items from one room of the home to the next with ease! Create an additional storage system by using baskets as drawers on bookshelves. This works particularly well in the home office, family room and kids’ bedrooms. Do you have a shoe pile near your front door? Place a basket near the front door for your family to toss their shoes in when they remove them. Who knew organisation could be so practical? We did! Finally, baskets are a great way to spruce up any room of your home. Think outside of the box and you’re sure to come up with a whole host of ideas!